Some people love to travel. Others love to read about traveling. Imagine an Internet magazine designed to bring these people together. Would you like to join ranks of their travelbloggers? Travel Blog is a swift and thrilling game about travelling. Your task is to pick a country or countries most suitable for your trip and to do it faster than your opponents. How many borders do you cross on your trip from France to Russia? Is it more or less than from Norway to Turkey? Detailed knowledge of the map is an advantage, but can be easily beaten by good intuition and fast decision making. The interesting facts about 100 countries and states are here just as a bonus. 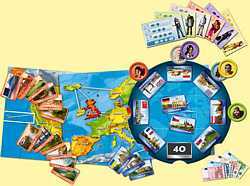 This is not a trivia game – Travel Blog keeps to be fun even if you get pretty familiar with the maps. And you can bet you will, after a few games.